Reclaimed wood is quite popular these days. The trend of repurposing items is a great way to go green and add character to your home at the same time. During the recent Parade of Homes the Dream Home in Stillwater was a prime example. This home showcased reclaimed wood in several places. The kitchen’s large center island was covered with reclaimed wood, but reclaimed wood was found in several other places as well. The kitchen’s cabinetry was white with the exception of the island, which was a weathered grey. The island not only contrasted in color, but also texture. 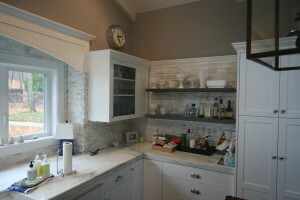 The reclaimed wood was much rougher than typical cabinetry. Similar wood was used as the ceiling finish in several rooms and on the walls of the stairway. The lower level bar was entirely rustic in a much darker reclaimed wood. It is hard to match the warmth and character that old wood provides. If you’re interested in adding some vintage character to your next project there are a couple businesses around town that specialize in reclaimed wood. In the case of the Stillwater Dream Home the wood came from Manomin Resawn Timbers in Hugo. (http://www.mrtimbers.com) Minnesota Barnwood in Lonsdale is another great resource. They have an impressive collection of barn wood. Both places offer it in timber, siding, and board form. Minnesota Barnwood (http://www.minnesotabarnwood.com) is deceiving at first, it looks like a little place that couldn’t possible sell large lumber. However, they have a large selection that is very organized. You can look for a certain color or wood species. Say you are looking for white barn wood and don’t see any, they will check to see if they have a barn take down on the schedule. Often they can tell you when they will have what you’re looking for. They can also tell you where the wood came from. It is fun to have the look and know at least a bit about where it came from. If this look is what you love, their websites are good places to browse. In addition, Houzz, Pinterest, and Etsy all have an abundance of ideas for reclaimed wood. Prepare to fall in love and feel overwhelmed! Save photos of what you like best. As always we encourage our customers to get what they really want. It is your home and we are custom woodworkers. We enjoy incorporating unique requests and materials into projects. So if this is a look that you love let us help you bring it to life. Reclaimed wood can be used for cabinetry, paneling, and ceilings as mentioned, but it can also be used to create custom furniture. Reclaimed timbers can make great mantels. This more rustic look has long been popular in cabins and lake homes, but if it is the look you love why not enjoy it every day? The use of reclaimed wood instantly adds personality and warmth, but it also is a responsible choice. This wood may have already been of service for over a hundred years and now can be given new purpose in your home.